The staff at Casper Fry is always eating, always testing. Whether it’s fried chicken passed around to wait staff for a snack or various people rotating around trying the sauces, demi glaces and gravies that simmer and reduce throughout the morning. What is idle behavior at other restaurants is an active part of the revision process here. “If you try something three or four times, it blows your palate, you lose the salt,” says Executive Chef Joshua Martin, dipping into a large pot of simmering country gravy. He likes to have everyone try something twice (“It’s a little rule we have”) to get a sense of the flavors and to offer their opinions. But Martin says this helps him as a chef hone in on the right mix of ingredients and seasonings. “If you give 10 people a recipe,” he says, “it’ll come out 10 different ways.” None of them are wrong, but some of them — and some individual elements — are more right than others. On the morning we hung out with him, as he braised lima beans and inspected rabbit loins and limbs for the evening’s special — a Southern-fried rabbit succotash — Martin talked about the way this process of revision, not long ago, left the kitchen, slipped past the front-of-house and ended up on diners’ tables, creating a dish that has spread through word-of-mouth (and also, word-of-Facebook) to become among the most talked-about items at the much-talked-about Southern joint. The restaurant’s mac and cheese was pretty popular, but Martin wasn’t happy. It was creamy and a little crunchy on top when baked, with a little heat and the earth of various herbs from “Casper Dust,” a house seasoning blend. The flavors on the mac weren’t quite right and the sauce still needed work, Martin thought, so one day at lunch he started playing around. “I threw in some bacon, then some cherry tomatoes, then some of our housemade sausage and it just kept getting better and better,” Martin says. Within a few days, Martin’s creation had become co-owner Ben Poffenroth’s lunch. The staff began asking for it. Word spread from server to patron and eventually got out into the wild. “People have been coming in off the street,” Martin says. At some point, the Internet got involved. And the dish served a purpose, Martin says, allowing him to use more of any given animal or cured meat (the restaurant tries to cook with as much of a beast as possible) and allowing the staff to keep experimenting. Along the way, favorite meats emerged — the house andouille, chorizo, bacon — among staff and guests. 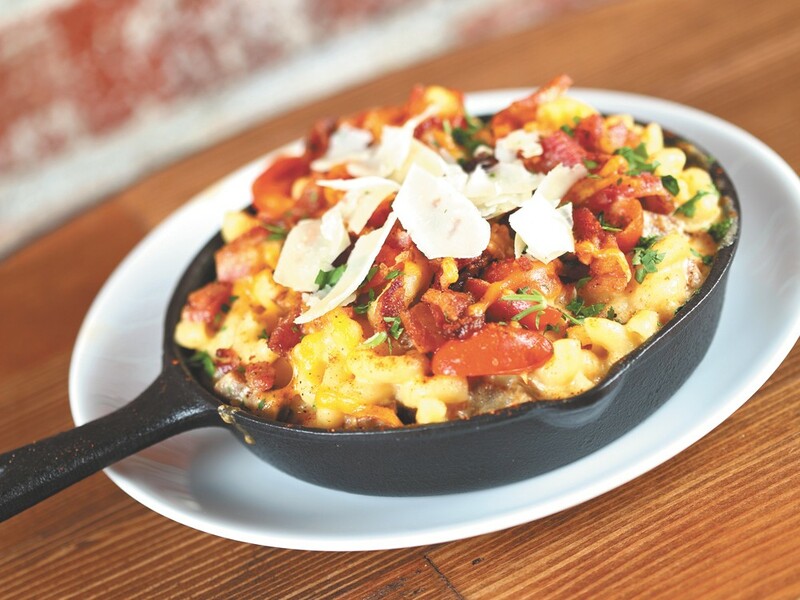 They’ve given it a name, “Loaded Mac” and developed a vegetarian version using roasted vegetables.